How do I use the bet slip to place bets in sports? Click on the [?] button for help on using the bet slip. 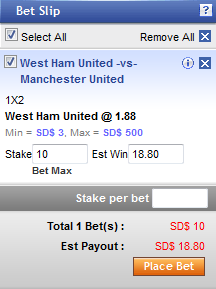 Use the Select All option to select or deselect all existing selections on your bet slip. Use the Remove All option to remove all existing selections from your bet slip. Use the single selection checkbox at the left of each selection to select or deselect individual selections on your bet slip. Move your mouse over the little (i) icon to view details such as match play time of each selection on your bet slip. Click on the blue [x] button of each selection to remove it from your bet slip. Displays information on the bet selection you are making, including the betting market, the selected bet option, and the odds price you are making the bet at. Check the minimum and maximum stake amount you can bet for each selection. 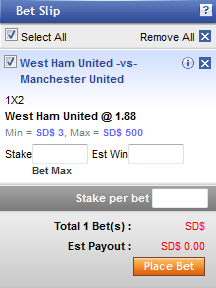 Click on Bet Max to use the maximum stake amount possible for a selection directly. Once you have entered your stake, the system automatically calculates the estimated potential winnings and displays it in the Est Win box. You can also enter the amount you wish to win in the Est Win box to determine the stake you have to place. Enter a stake amount in the Stake per bet box to repeat the same stake amount for all selections on your bet slip. Check the total number of bet selections and total stake amount you have made in your bet slip. Check the total estimated payout you could possibly win with the selections you have made on your bet slip. You may make your selections prior to signing in and these selections will be retained after you sign in. Select a sport (e.g. Football), a region (e.g. England) and a league (e.g. English Premier League) from the events menu on the left to view the events offered for betting. Scroll to the betting market you wish to place a bet on and click on the desired team or player option to add the selection to your bet slip. Betting Markets: Toggle between the date tabs (e.g. Today) to view events for a specific day. Toggle between the different market tabs (e.g. 1X2) to view events offered for betting under a specific betting market. Show or Hide Markets: Choose to expand or collapse betting markets by clicking on the header of the market. View All Markets: Click on the blue numbered box on the right of the bet options to view all betting markets available for betting for that event. My Markets: Click on the [+] button of a betting market or select the My Markets tab to add specific betting markets to your watch list. Click on another desired team or player option to add more selections to your bet slip. Bet Selections: Each time you add a selection to your bet slip, the selection will be highlighted on the betting market panel to indicate that it has been added to your bet slip. Check the information displayed on the bet slip to ensure that the bet details are correct. Enter your bet stake for each selection and click the Place Bet button to place a bet. Our system is only able to accept whole numbers as stake. Decimal amounts like 7.50 or 6.68 are not supported. Stake per Bet: Enter a stake amount in the Stake per bet box to repeat the same stake amount for all selections on your bet slip. Your bet is accepted by our system and not allowed to be cancelled once you click on Place Bet to confirm the bet. 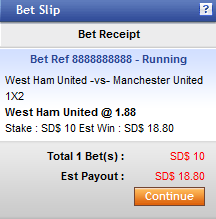 Check the information displayed on your bet receipt to ensure that the bet details for each selection are correct. Bet Ref: A unique reference number used for identifying each bet. Check the total number of bet selections and total stake amount you have made at the bottom of your bet slip, and the estimated payout you could possibly win for the bet. Click on the Continue button to open a new bet slip. Check the bet you have made by expanding the My Bets panel below your bet slip or by clicking on My Bets from the top menu.